Marble- Marble is a natural stone that is an attractive option to many due to its beauty and elegance. Some may hesitate due to perceived cost, but some varieties of marble can be even more affordable than granite or quartz. Like the other options discussed here, marble is easy to clean, but it can be more vulnerable to staining due to its relative softness. Make sure to have your counters sealed if you want to limit stains. Marble is also susceptible to surface etching because its chemical structure reacts easily with acids. Because of these factors, marble requires more maintenance to keep it pristine, but many prefer the more weathered look that can result from etching or scratches. Granite- Like marble, granite is quarried out of the ground. It is a natural stone available in many colors and patterns, allowing you the selection to realize your design vision. Granite is extremely hard, and will resist scratching and other wear and tear. Also like marble, granite requires a proper seal to keep it impervious to liquid; once sealed, however, you won’t have to worry about stains to your counters. Another advantage is that granite resists heat, so you can set down hot pans on it with no worries. Overall, granite is an attractive option that lends any home an air of luxury. Quartz- Quartz counters are not quarried, but are manufactured with a mixture of ground quartz (usually about 94%), resins, and pigments. The resin component of quartz counters create a water-tight seal that never needs to be reapplied, and prevents stains or odors from penetrating the surface. Quartz is available in a comparable number of patterns and textures as granite, while being more flexible in its design options as it allows for cleaner cuts and seams. One thing to keep in mind, though, is that quartz is not as resistant to heat as natural stone, meaning you should remember to use a trivet to set down those hot pans. 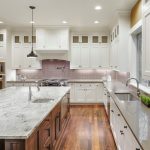 If you are considering new kitchen countertops for your home, call our team at The Granite Guy to go over your options. We will help you choose the best countertops for your design and budget needs.